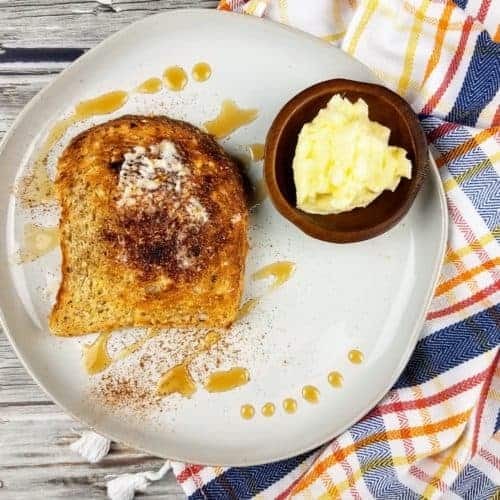 There is nothing better than a slice of freshly baked bread topped with a pat of homemade butter. I first learned to make homemade butter with a Mason jar in graduate school. 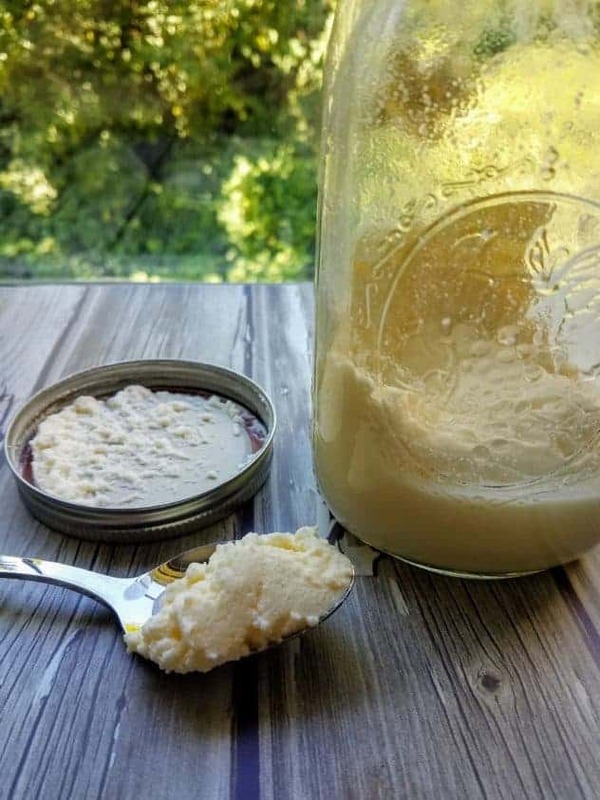 I don’t remember how we got on the subject, but one of my office mates had mentioned making homemade butter with a mason jar. I became very intrigued, so I went home and googled it. And sure enough, it was a thing! I remember making butter in girl scouts by churning it the old fashioned way, but I had never thought to make it in a Mason jar. I won’t lie, the process is a little labor intensive. But, the end result is definitely rewarding :). So turn on some Friends, Seinfeld, or The Fresh Prince of Bel-Air, and let’s get started! How do you make homemade butter? 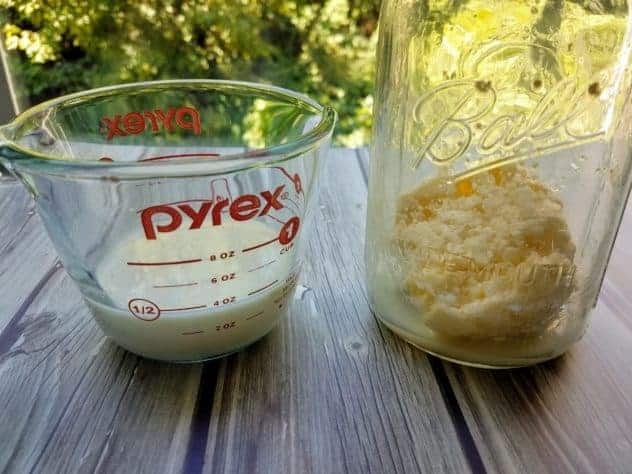 There are a couple of ways to make homemade butter, but my favorite way is using a good old fashioned Mason jar. You just pour the heavy cream into the jar, tighten the lid, and shake away for 10-20 minutes. It’s environmentally friendly, you get a great full body workout, and you get about 1/2 cup of butter and 1 cup of buttermilk which you can use in other recipes. Can I make salted butter? Yes! 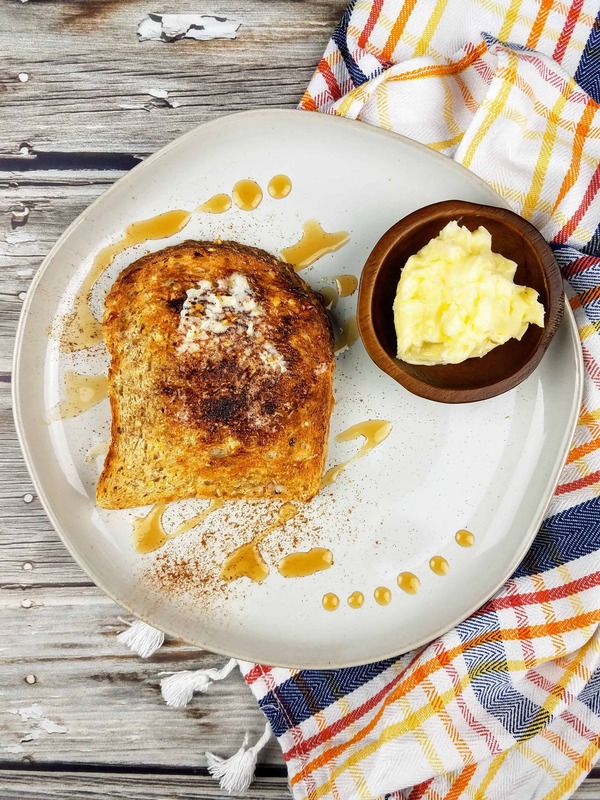 What’s great about homemade butter is that you can customize it right from the get go. Some great add-ins include salt, honey, cinnamon, sugar, fresh herbs, and spices. All add-ins are added at the very end of the butter making process. How long can you keep homemade butter? The shelf life of homemade butter really depends on how well you extracted the buttermilk. If a lot of buttermilk remains in the butter, it will go rancid within a few days. If the majority of the buttermilk was extracted, homemade butter will keep in the fridge for 2-3 weeks. Personally, if I am making homemade butter, I plan to use both the butter and the buttermilk the next day. If any butter remains, I stick it in a glass container and freeze it for later use in baking recipes. How long does it take to turn cream into butter? 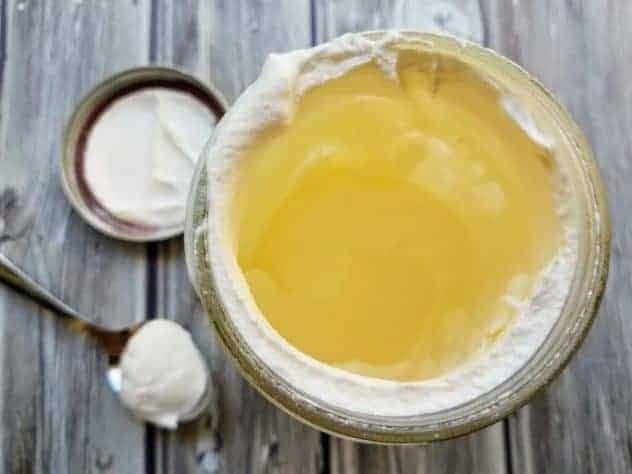 The time it takes to turn cream into butter really depends on how fast and how hard you are shaking the mason jar. For me, it generally takes about 10-15 minutes to turn 1 cup of cream into butter and buttermilk. 1. Open the container of heavy cream and pour into a cleaned and dried mason jar. Tighten the lid. 2. Hold the Mason jar with both hands lid side facing up, and shake vigorously for 4-5 minutes. Hear the sloshing sound of the liquid as you shake the jar? When that sound goes away, you are at the whipped cream stage. Pretty neat eh? 3. This is where the process gets a little labor intensive. You are going to have to apply a lot more force to move the solid whipped cream around. My technique for this stage (patent pending…jk ;)) is to shake the jar hard once with the lid facing up, then flip the jar upside down so that the lid is facing down and shake it once again. So you shake once, flip the jar over, shake once again, flip the jar back upright, and so on. Do this for another 7-10 minutes. What you will see happen, is the whipped cream will start to condense down prior to turning into butter and buttermilk. 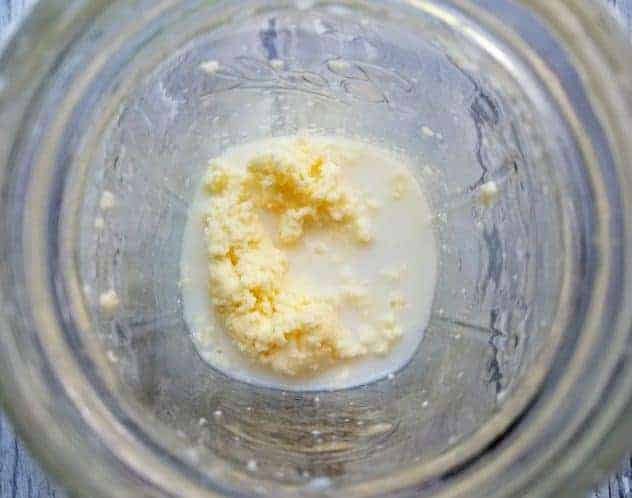 As you move from the whipped cream stage to the butter stage, the sides of the jar will no longer be completely coated and you will be able to see through in spots. You will also see the formation of a thin white liquid. This is your buttermilk! This is also the point when the solids start to turn a beautiful yellow. 4. Keep shaking using the method in step 3. As your butter starts to condense down into a single solid mass, each time you shake the jar you will hear a plunk and feel it hit the bottom of the container. Once you accumulate enough buttermilk in the jar (~1/2 cup), drain off the buttermilk into a measuring cup. I like to give the butter a few more good shakes to get any remaining buttermilk out. 5. Dump the butter into a large bowl. To prevent the butter from going rancid, it’s important to wash away as much buttermilk as possible. You can do this by rinsing the butter with cold water. First, pour about 4 oz of cold water (the water needs to be cold so the butter holds its shape) over the butter. Then using a spoon and tilting the bowl up on its side so a lot of the butter is in contact with the water, mash the butter against the side of the bowl and swish water over it to remove butter milk. After doing this a few times, drain off the diluted buttermilk into the measuring cup. This should yield a full cup of buttermilk which you can pour into a storage jar and place in the refrigerator for future use. 6. 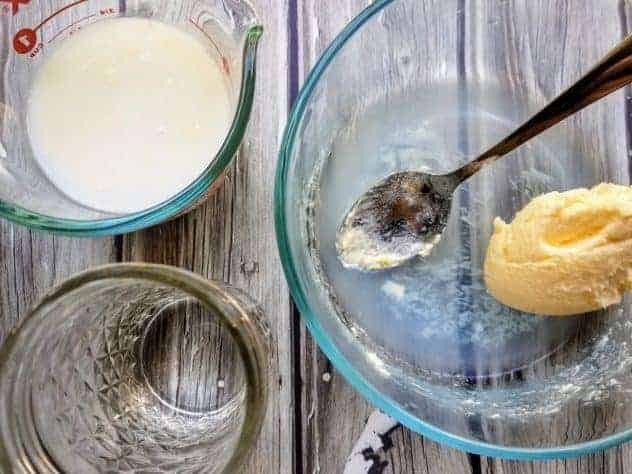 To ensure all of the buttermilk has been washed away, pick the butter up and begin massaging it under a stream of cold water (the buttermilk that you are washing away at this point is so dilute, that it’s not even worth saving). You now have ~1/2 cup of fresh homemade butter and 1 cup of buttermilk! If you are looking to customize your butter by adding in herbs, spices, honey, etc., this is when you want to add those things in. 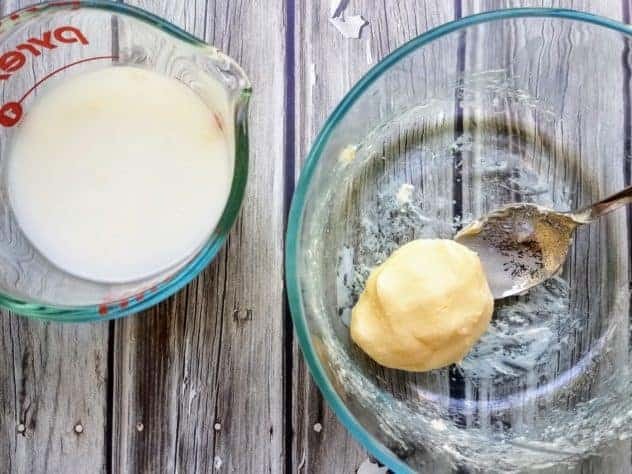 This homemade butter using a Mason jar is incredible! Easy to make, and easy to customize for any dish or baked good that you would like to use it in. 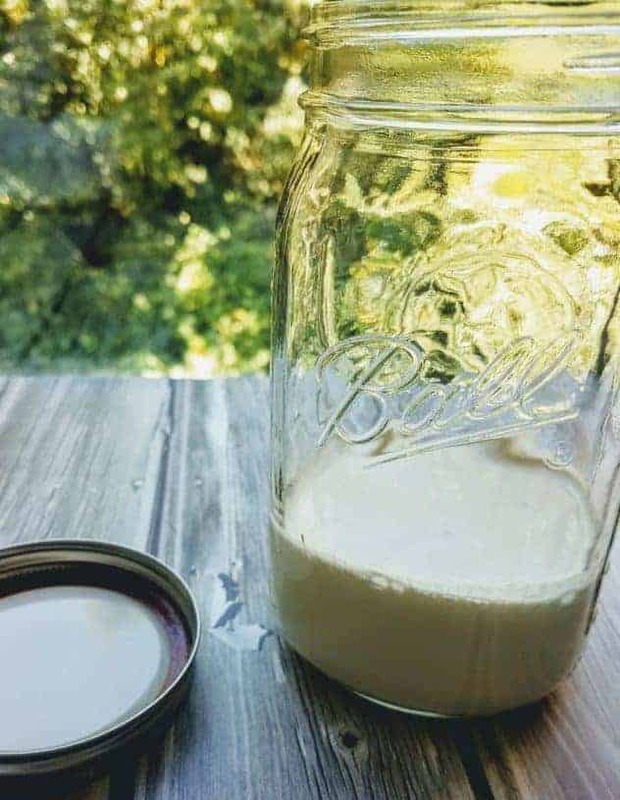 Open the container of heavy cream and pour into a cleaned and dried mason jar. Tighten the lid. Hold the Mason jar with both hands lid side facing up, and shake vigorously for 4-5 minutes, or until you reach the whipped cream stage. 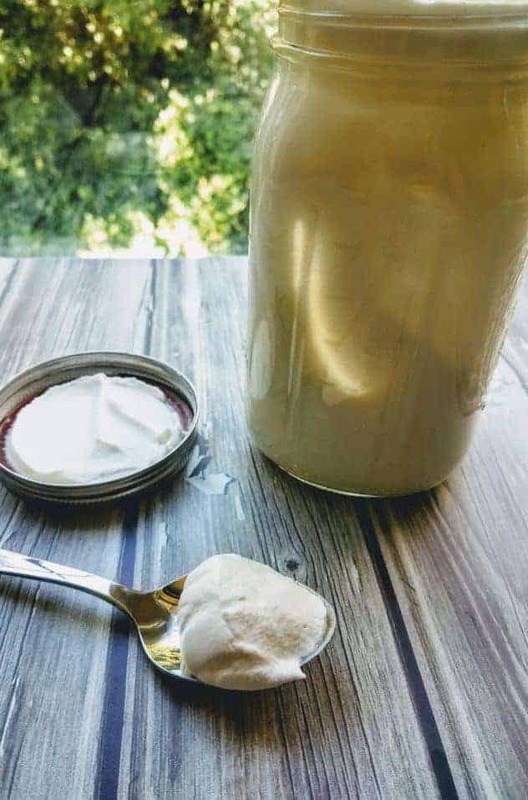 Continue shaking for another 7-10 minutes or until you get butter and buttermilk, using the following method: shake the jar hard once with the lid facing up, then flip the jar upside down so that the lid is facing down and shake it once again. So you shake once, flip the jar over, shake once again, flip the jar back upright, and so on. Once you accumulate enough buttermilk in the jar (~1/2 cup), drain off the buttermilk into a measuring cup. Give the butter a few more good shakes to get any remaining buttermilk out. Dump the butter into a large bowl. Pour about 4 oz of cold water over the butter. Then using a spoon and tilting the bowl up on its side so a lot of the butter is in contact with the water, mash the butter against the side of the bowl and swish water over it to remove butter milk. After doing this a few times, drain off the diluted buttermilk into the measuring cup. This should yield a full cup of buttermilk which you can pour into a storage jar and place in the refrigerator for future use. 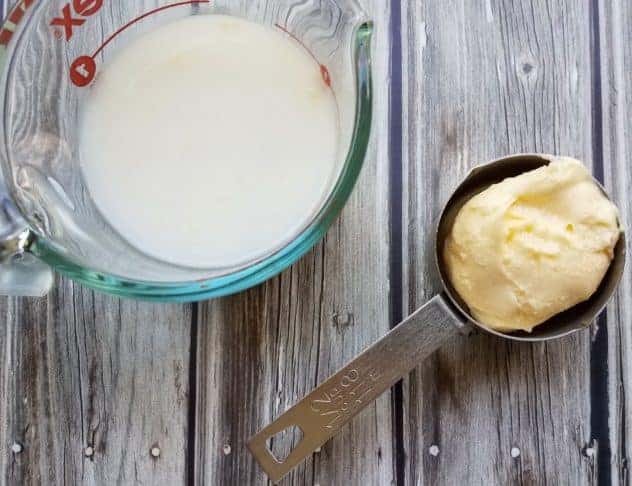 To ensure all of the buttermilk has been washed away, pick the butter up and begin massaging it under a stream of cold water (the buttermilk that you are washing away at this point is so dilute, that it’s not even worth saving). You now have ~1/2 cup of fresh homemade butter and 1 cup of buttermilk! If you are looking to customize your butter by adding in herbs, spices, honey, etc., this is when you want to add those things in. When purchasing heavy cream, be sure to choose one that is preservative free. The only ingredient should be cream. Oh this sounds so delicious!!! I need to go make a loaf of bread right now! Yes! 🙂 And you know which bread you should pair it with? This French bread by Chef in Training: https://www.chef-in-training.com/french-bread/. BEST bread I have ever had! Oh wow! This is beyond unique Lol. So what you’re saying is that I should abandon my weekly exercises, get a Mason jar, heavy cream and get in my daily cardio? Copy. Lol. I remember us “frying” eggs in a microwave in college and baking potatoes in a microwave too. DOn’t ask why we did the things we did then. We had a working cooker/oven too. Sigh. Lol. This is awesome. My class made butter on a field trip, they loved it and got to eat the butter on crackers when it was done. Hmm I like this one. Will try someday. I sometimes play video games and I have many more video games coming up on my PS. SO this food will surely keep my energy up.And yes Thank You for the recipes and clarifying out the doubts which I may have. Woah, I never knew it was this easy to make butter! The thought of making it myself never crossed my mind but now I kind of want to try it haha. Plus buttermilk pancakes at the end! My mum makes home made butter and its delicious then the shop ones . I never saw the process of making it . But now I know how she did it . Will surprise her by making it myself . Thanks ! Thank you on this. I haven’t made butter yet at home. Now with your help I can try ???? Great recipe! I’m saving this to my Pinterest board as I would like to start making more things from scratch.